By the time Sam came into this world, I had his quilt finished. It was a simple pattern and was crib size. He still uses it on his bed today. It was the first quilt I pieced and quilted myself. 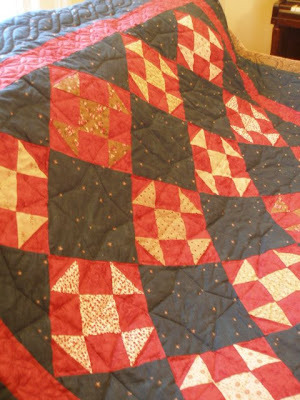 I had helped my mother and grandmother quilt in the past, having learned how from them (maybe) when I was nine or ten years old. My grandmother on my mother's side made many quilts over the years, gifting them to her children and grandchildren on birthdays and as wedding gifts. 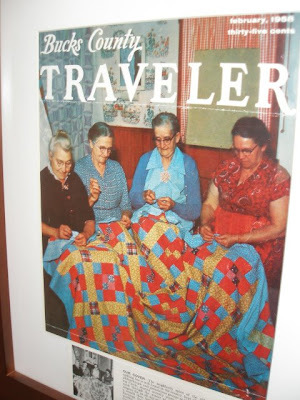 My great grandmother on my father's side was also a quilter. Here she is (second from left) on the cover of a local (to her home) magazine. The cover is framed and in my dining room. 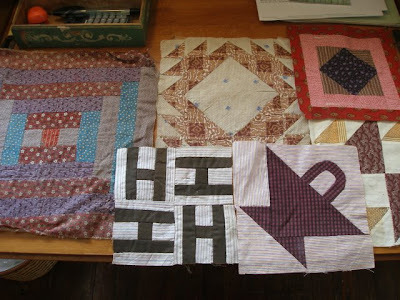 Below are some samples of this great grandmother's quilting. More treasures I chose from my grandparent's house. One day, I'd like to frame these, too, and hang them around the magazine cover. On Saturday, three and a half years after I started it, I finished Sadie's quilt. 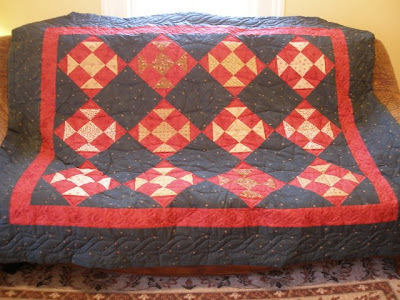 It's twin bed-sized and involved more detailed piecing and quilting than did Sam's. Like Sam's, I designed it, using fabric I had picked up here and there. On Sunday, I started planning and cutting fabric for the baby's quilt. The baby inspired me by looking sweet as can be in the ultrasound we had on Friday. He or she (we don't find out the gender) had the hiccups, was sucking away at nothing and showing us his/her fingers. Yes, baby, I am making a quilt for you, too. This time, due to the fact that I have been given many beautiful fabric swatches by my interior designer-friend, Laura, and that we are living off student loans, I am going to do my best not to buy any fabric for this one. I'll try to remember to show pictures as I go along. In the meantime, here are some more of Sadie's quilt. She's excited to use it on the big-girl bed she'll move to in a few months. Beautiful quilt you made for Sadie...wow. I'm envious! I love the picture of your great grandmother...how cool is that? Your idea to hang her quilt pieces is great...that would be a nice display. Beautiful. And one day it will be nice to have family heritage hanging on the wall. My maternal grandmother and great-grandmothers all quilted. They are truly heirlooms, and I treasure them all. Your's are beautiful, what a blessing for your children. 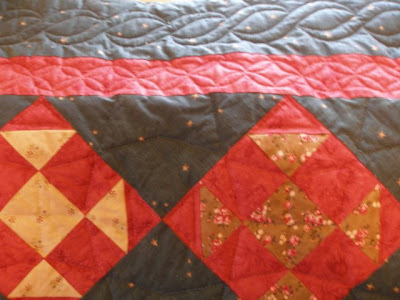 Aren't quilts such a wonderful "homey" project to indulge in. I have to design and make one for my son's 8th grade class at Kraybill Mennonite School. Which will than be auctioned off. After spending all that time and energy it is a bit hard to give them up. No secret. Just verbally promise it so that you can't back out. It did help me to personally know the families that bought my other quilts. I know they cherish them. I guess the relief sale would be another scenario. I've thought about that too. Maybe some day. I love the colors you chose. I'm working on a few baby comforters to give as gifts and also a crazy patch wall hanging. It is rather hard to give them up and they aren't even hand quilted! Wow! Another thing about you I didn't know...you quilt! Sadie's is gorgeous! I never knew anything about quilting, until I started doing the quilt book for the MCC Relief Sale down here each year for the last 3 years, and am realizing what a beautiful art it is. I also didn't know the little factoid about Great Grandma, so I'm sooo glad to be learning this from you, and see what you're preserving! Did you actually hand-quilt this one, too? That's amazing! I am in the process of hand-quilting one that I made for mine and Rob's bed - it's taken about 6 months so far, and I'm still not done! About another month, I think. And I'm not doing it like you did this one - gorgeous!